Click here to download a PDF of the Practice SAT Chemistry Subject Test 3. You are about to take the third practice SAT Chemistry Subject Test. After answering questions 1–32, which constitute Part A, you'll be directed to answer questions 101–116, which constitute Part B. Then, begin again at question 33. 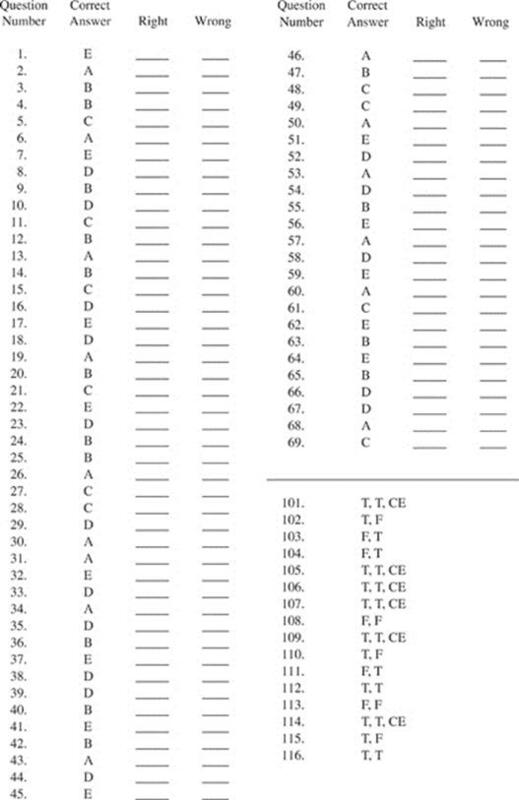 Questions 33–69 constitute Part C.
Questions 1–5 refer to the following. Questions 6–9 refer to the following. Questions 10–14 refer to the following. Questions 15–19 refer to the following. Questions 20–24 refer to the following. Questions 25–28 refer to the following. Questions 29–32 refer to the following. RETURN TO THE SECTION OF YOUR ANSWER SHEET YOU STARTED FOR CHEMISTRY AND ANSWER QUESTIONS 33–69. 33. Choose the answer below that accurately describes the correct molecular shape for the molecule XeOF4. 34. For the radioactive atom 99Tc, what is the correct number of protons and neutrons? 35. Which one of the following acids is NOT strong? 36. Identify the equation used to determine the amount of heat required to melt 10 grams of ice. 37. Identify the correct ground state electron configuration for Cr. 38. What is the hydroxide concentration for a solution with a pH of 10 at 25°C? 39. Five hundred milliliters of solution of 0.1 M NaBr has how many milligrams of bromine? 40. According to the ideal gas law, what is the approximate volume that will be occupied by 0.5 mole of an ideal gas at 30°C and 3 atm pressure (gas constant R = 0.0821 L•atm/mol•K)? 41. Given that ΔG = ΔH – TΔS, how is the spontaneity of an endothermic reaction expected to change with decreasing T? 42. Identify the element with the greatest first ionization energy. 43. Identify the molecule/ion with the greatest potential to act as a Lewis acid. 44. Which coefficient balances the reaction given above? 45. A 100-milliliter solution containing AgNO3 was treated with excess NaCl to completely precipitate the silver as AgCl. If 5.7 g AgCl was obtained, what was the concentration of Ag+ in the original solution? 46. Identify which of the following statements is FALSE. (A) The vapor pressure of a liquid decreases with increasing atmospheric pressure. (B) The value of an equilibrium constant is dependent on temperature. (C) The rate of a spontaneous reaction cannot be determined solely by its Gibbs free energy. (D) During a phase transition, the temperature of a substance must be constant. (E) The addition of a catalyst to a reaction at equilibrium has no net effect on the system. 47. Which of the following compounds would be expected to have the greatest lattice binding energy? 49. Which of the following reactions produces a yellow precipitate? 50. In the electrochemical cell described by the cell diagram above, what reaction occurs at the anode? 51. Given the reaction A → B + C, where ΔHrxn is negative, what effect would increasing the temperature (at constant pressure) have on the system at equilibrium? 52. An unknown acid solution was presumed to be either HCl or H2SO4. Which one of the following salt solutions would produce a precipitate when added to H2SO4 but not when added to HCl? 53. What is the equilibrium expression for the dissolution of Ca3(PO4)2 where the above is true? 54. Which of the following represents a conjugate acid/base pair? 55. An unknown solution having a pH of 3.5 was titrated with 0.1 M NaOH. Analysis of the resulting titration curve showed a single equivalence point at pH 7. Therefore, which of the following could be the unknown solute in the initial solution? 57. What is the correct term for the phase change from gas directly to solid? 58. What is the correct name for a straight-chained organic compound with the molecular formula C3H8? 59. If the pH of a solution is changed from 1 to 3 with the addition of an antacid, what percentage of [H+] was neutralized? 60. Which of the following statements is the most accurate with regard to the significance of Avogadro's number, 6.02 × 1023? (A) It is the conversion factor between grams and atomic mass units. (B) It is a universal physical constant just as the speed of light. (C) It is the number of particles that is required to fill a 1-liter container. (D) It is the inverse diameter of an H atom. (E) It is the number of electrons in the universe. 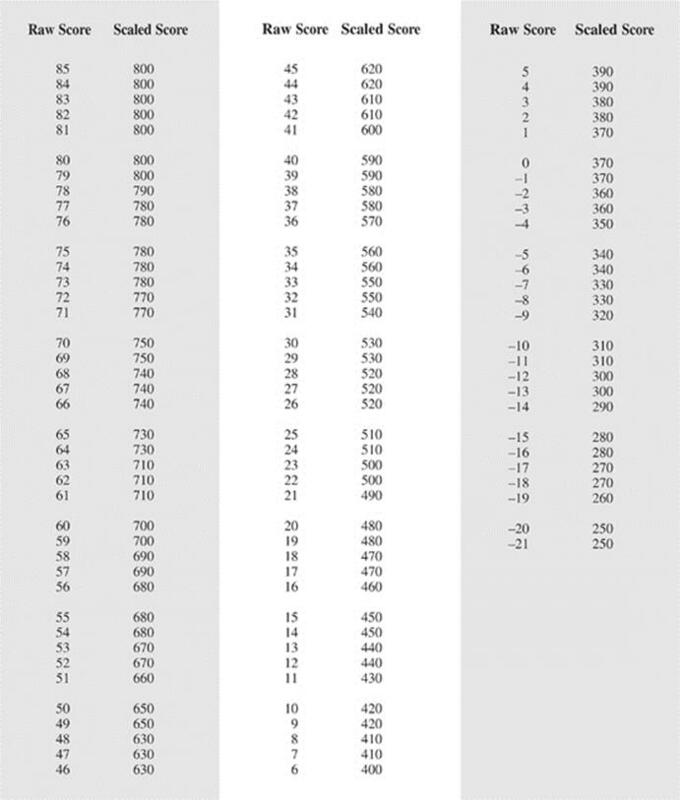 Questions 61–64 refer to the following data at standard conditions. 63. The addition of dilute HCl to unknown metal #1 produced a transparent gas. What is the likely identity of this gas? 64. The addition of dilute HNO3 to unknown metal #2 produced an orange gas. What is the likely identity of this gas? 65. Which of the following solutions is the product of the neutralization reaction between 10 ml 0.2 M KOH and 10 ml 0.2 M HI? 66. Which of the following is true regarding an Ne atom with a mass number of 20 and an O2– ion with a mass number of 16? (A) They contain the same number of protons. (B) They contain the same number of neutrons. (C) They contain the same number of protons plus neutrons. 67. Which of the following statements is NOT correct regarding chemical catalysts? (A) They are not consumed during the chemical reaction. (B) They cannot make nonspontaneous reactions occur. (C) They do not have to be the same phase as the reactant molecules. (D) They shift equilibrated reactions to the product's side. (E) Enzymes are biological catalysts. 68. 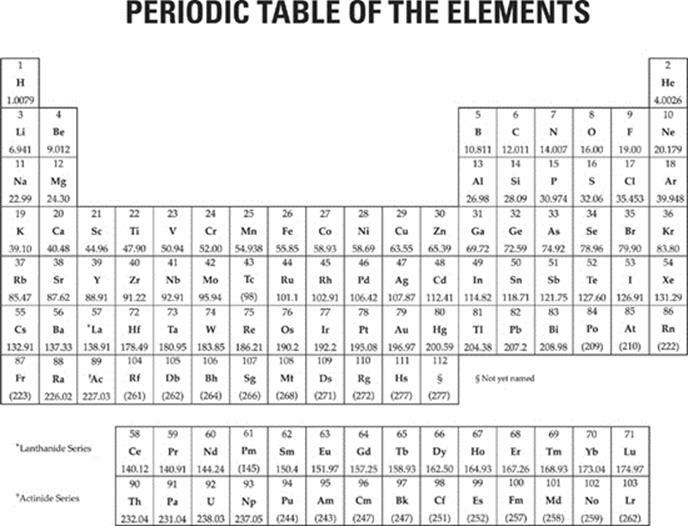 Most elements are solids at 25°C and 1 atm pressure, the exception being the 11 elements that are gases and 2 that are liquids. What 2 elements are liquids?